This page is very special to me. It depicts my daughter placing wildflowers upon her brother's grave. Adam would have been 9 years old this past April. I am trying to teach my children that they should honor the memories of those that have gone before them. Gone but not forgotten is my mantra. Nothing can ever take awaythe LOVE a heart holds dear. Fond memories linger EVERY DAYRemembrance keeps them near. Unknown Author xoxo, Kaylie. Kaylie placing Buttercups and Dandelions on Adam's Grave. Kaylie's handwritten name and heart were scanned.Round alpha by MissVivi, Bayadere kit.Black tied ribbon by Traci Sims.Round glass element by Taran Conyers. 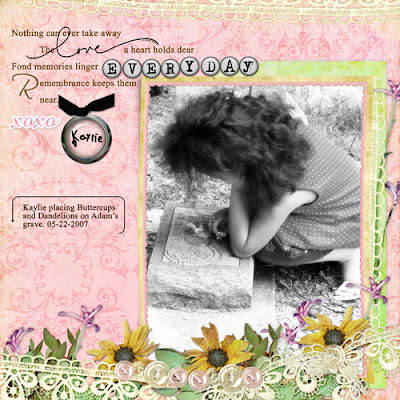 (a freebie from eons ago)The journaling stamp is by Kellie H. Mize, DesigerDigitalsThe word "LOVE" is from Taran Conyer's Timeless Echoes - Josephine page set, at SBGhttp://www.scrapbookgraphics.com/xca...t=0&page=2Dried flowers - Garden Variety by Doris Castle.http://www.scrapbookgraphics.com/xca...t=0&page=1Sunlit Memories page set, by Doris Castle at SBGhttp://www.scrapbookgraphics.com/xca...t=0&page=1Template (modified) Simply Elegant 3, by Janet Phillips, SBGhttp://www.scrapbookgraphics.com/xca...t=0&page=1Shimmer Shop: Shimmer words, by Kristin Kristin Cronin Barrow-SBGhttp://www.scrapbookgraphics.com/xca...t=0&page=1Fonts: Scritina (R), Times New Roman.